"Call Pam & Start Pack'n"
To exceed my clients expectations through outstanding service, intelligent advice, aggressive negotiating, and enthusiastic marketing. To follow the golden rule and treat everyone with fairness and respect. To have fun and conduct my real estate business with integrity and professionalism. "I like introducing people to communities and seeing how they enrich their lives. I like the opportunity to meet wonderful people and become a trusted professional in their lives, and I love helping people through the emotional journey of buying or selling their home." I was born in Idaho where I later became a full-time Realtor in 1980. In 1983 I moved to the Valley of the Sun with my daughter Pele, who was only a year and a half at the time. Now she is a Policy Advisor and Staff Attorney right here in Phoenix and I am a proud grandmother of her two adorable little boys! I have been a Licensed Associate Broker for 30 years, as well as a Certified Residential Specialist (CRS) and an Accredited Buyer Representative (ABR). I have many credentials, such as 2000 Agent of the Year-Phoenix Metropolitan, and Top Office Producer Awards-Re/Max Achievers, Prudential AZ Realty, West USA Realty, Realty Experts, Pam Peacock Realty, & West Valley Realty in Idaho. 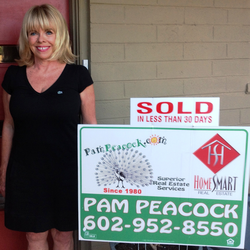 I am a People Pleaser - Representing Buyers & Sellers in Scottsdale, Paradise Valley, Carefree, Tempe & Phoenix. I have an Eye for design, excellent style, energy & drive. I am also a passionate, devoted, and proud mother who enjoys all sports, mentoring, cooking, traveling, and enjoying all aspects of life with family and friends. *Pele and I now share an office at the Marilyn located at 4602 E. Thomas Road, Phoenix Arizona 85018. To learn more visit Peacock.Legal. Her firm specializes in government affairs and legal consulting. Voted Agent of The Year by My Peers! Search MLS Directly By Clicking Here! Please Send Me a Message! "A real house is not a home unless it contains food and fire for the mind as well as the body."